I was at the beach a few weeks ago when I witnessed a three-generation family taking a group selfie (just try to make me call it an usie) in the surf using a selfie stick. A few minutes later, an adult couple repeated the scene. And so on. When, I wondered, did this weird little gimmick become a ubiquitous gadget? As CES wrap-ups began popping up online last week, I was surprised to see the not-at-all-new selfie stick dominating the bunch—Eric Limer even published a photo essay on the insidious selfie stick here on Gizmodo. What's so odd about all the gadget-y buzz is that, even though it was the darling of the largest convention on new tech in the world, the selfie stick isn't new at all. It's been around for years—decades, even. Now, it's reaching critical mass of users outside of technophiles and weirdos to push itself back into our myopic field of vision. Because here's the thing about the selfie stick: It's a really, really good idea. However much you loathe it, however much disgust you feel at the gnawing industrial narcissism complex we've built for ourselves, it's a seriously brilliant object. As proof of its success, look no further than the intellectual property lawsuits and contentious legal policies that have sprung up around it. 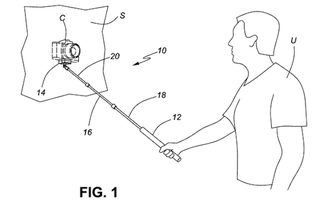 Apparatus for supporting a camera and method for using the apparatus, filed in 2006 by Wayne G. Fromm. The problem with Fromm's lawsuits, as NY Mag details, is that you can't patent an idea—"knockoffs" that are simply based on the same general concept don't necessarily infringe on the specifics patent. Retractable camera arm, filed by Michael Daoud, John R. Stump in 2006. Portable video camera/monitor support, filed in 1988 by Donald N. Horn, Bern Levy. Long before digital cameras even existed, the selfie stick was kicking around. A few weeks ago the BBC asked "Does 1925 photo show the first 'selfie stick?" of a 90-year-old photo of a couple seemingly taken from a camera mounted on the end of a stick. In short, no one "invented" the selfie stick. It rose out of the primordial ooze, like our slithering forebears, in response to an unambiguous and universal need for it. So we've been attempting to view ourselves from above for nearly a century, and not just with selfie sticks. In fact, surveillance from above is pervasive in our world—whether via drones, Second Life, satellites, films, or Belfies. Why are we so obsessed with seeing ourselves (and others) from a bird's eye view? One of the most interesting theories comes from the technology and design critic Richard Coyne, who has described the selfies taken by those crazy teenage urban explorers atop skyscrapers as "a contemporary and dynamic expression of the sublime — an amplified variant of the iconic romantic paintings of artists such as Caspar David Friedrich." Bombarded everywhere by images of opportunity and escape, the very circumstances of a free and meaningful human life have become kaleidoscopic, vertiginous. Under these conditions, the definition of reality itself has become uncertain. New forms of literacy and new means of orientation are called for. Stay with me. What he's saying is that we spend our days viewing the world through a multitude of screens and perspectives, most of which weren't available even a few decades ago. There are just so many new ways to see the world—and so many new ways see ourselves. A 15th century Flemish duchess. A Second Life avatar. A North Korean hacker. In comparison, the wealth of new ways to see ourselves as we "really" are, from above, are attractively honest. And the selfie stick is the easiest to use and cheapest to buy of all of them. The dominant paradigm in technology over the past decade has been trying to figure out how our real world lives and screen lives should (or shouldn't) connect. For example, the revving up of the selfie stick has been paralleled by the quiet slumping of another consumer device for recording the real world and interacting with the digital one at the same time: Google Glass. It was, unequivocally, a very poor and complicated and dangerous way of doing that very simple thing. That's what makes the selfie stick so brilliant, and its designer so totally unimportant. It solves a complex problem—a problem that plenty of major technology companies have failed at solving—with the dumbest and most logical solution out there. Unlike Glass, smartwatches, drones, and any other conspicuous means of putting the real world on the internet, it's a non-entity, an anonymous, throwaway object whose real product is the image it facilitates. It lets us take pictures of our real lives, as silly and unflattering or awesome as those real lives sometimes are. We look like total dweebs when we use it, but honest dweebs. Lead image: Camera Steadying Device, filed in 2012 by Wayne G. Fromm. Update: Wayne Fromm's patent was actually filed in 2005, not 2006, through application #11125693. This story has been edited to reflect the correction.